A Word Wall is a wall etched with a set of words in the Dragon Language. Multiple Word Walls can be found in various locations throughout Skyrim. On each Word Wall one of these words may be highlighted. A highlighted word is a Word of Power, that allows you to unlock one word in one of the twenty Dragon Shouts. Once you have found a Word of Power you must absorb a Dragon soul to use the associated Dragon Shout. You can only obtain one location at a time from each method, but you can use both methods at once. Neither source will ever direct you to a location that is potentially quest-locked (even if the quest is active), or to locations that are missing from their list (Frostmere Crypt and Shalidor's Maze). The text shown on the Word Wall depends on how many words you've learned for that shout. For example, if you have already learned the first word in the shout Aura Whisper in Volunruud, then if you visit either Northwind Summit or Valthume, the Word Wall will be for the second word. This means that the Word Wall's text changes, depending on which Word(s) you've already learned; the two exceptions are Throw Voice (Shearpoint) and Unrelenting Force (Bleak Falls Barrow). Does not have a word wall. (the) mind of (a) steel-souled warrior. (the) last by the trolls of Korvag Crag. his body does now in (the) ground. in (the) battle of (the) Serpent Sea. (the) Kings of the East, conqueror of Dunkreath. rest now in (the) soil (of) Skyrim. The choral part of the "Word Learned" sound effect is considered to be music and will not be heard if your music volume is set to zero. 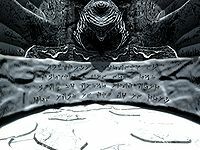 There are two ruined word walls that you are unable to learn from; one in Sovngarde and one in the Soul CairnDG. The "word wall" for Drain Vitality located in the Forgotten Vale is not a traditional ancient Nordic structure, but rather a large boulder with a single word carved into it. Occasionally, when you approach a word wall from which you had previously learned a word, you will hear the chanting and sizzling sound that you normally hear from a word wall you've never visited. This page was last modified on 19 June 2017, at 18:35.